HP Networking had some announcements today at InterOp. It was a big media event with cameras, live broadcasts, and some interesting industry figures are in the room. Here’s my take on the strategy, I’ll post some more on the actual product announcements in a separate post. The new “strategy” from HP involves the word Flexi an awful lot. Given that there has a been a lot of marketing around FlexModules and FlexConnect it kind of makes sense. This slide sums it up. What I perceive is that HP Networking is extending their message to say that they have products to fit more, or even all, of the market categories. 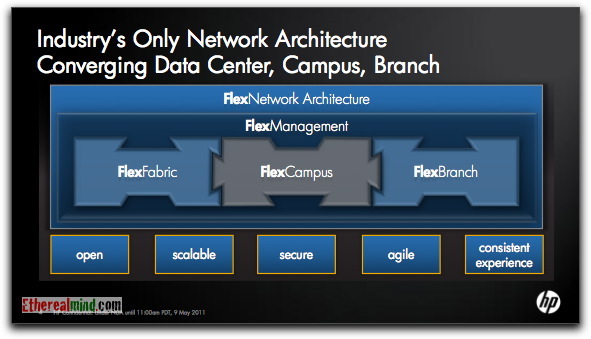 In particular, the “FlexCampus” term is new and meant to convey that they now have products that fit the Campus networking category. Of course, they always did, that’s exactly what was they did – the A10500 switch was announced with some supporting access layer products. If you are steeped in Marketing speak, then this slide is helpful. It shows the positioning of each product family into a market segment in the way that HP wants you to think. 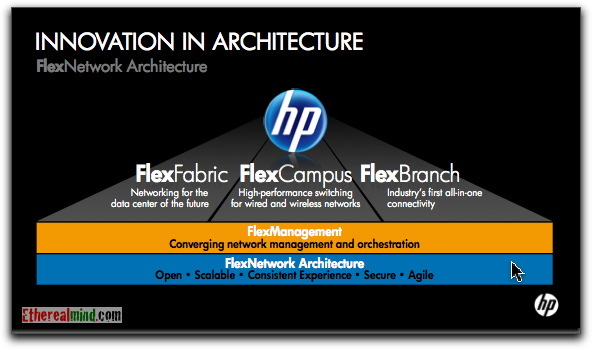 FlexFabric = DataCenter – so lots of virtualization support, IRF, Tipping Point Secure Virtualization Framework. FlexCampus – Campus – today we are looking for STP/MSTP/RSTP support at a price point that fills the switching closets with lots of high density Ethernet. FlexBranch – WAN routers, edge switches. What’s new here is that products for Campus have been beefed up with the A10500 switch. more on that later. I liked the fact that HP is basically taking shots at Cisco’s marketing position, it’s clear and direct – refreshing. Several of these do strike home because there is a lot of truth in them. 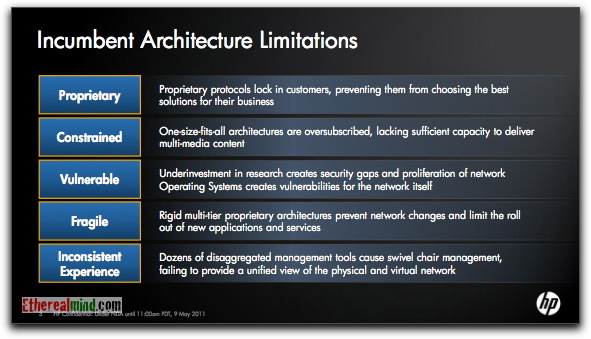 I don’t think that it’s Cisco bashing to pick out weakest points of a competitor. 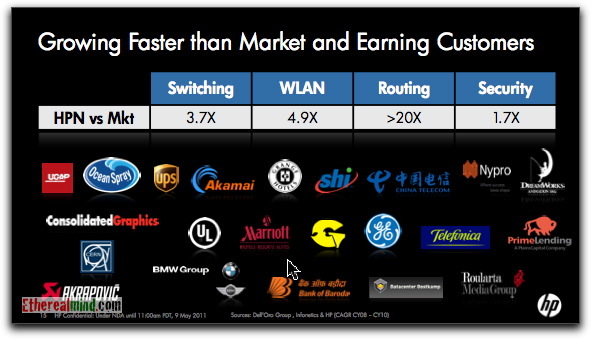 After all, Cisco has left a lot of gaps in their portfolio by being slow to market, and haven’t been adding value to their equipment for the last five years. Security is embedded into the products ie. there isn’t a separate security portfolio. I’m not clear on how this is “agile”. 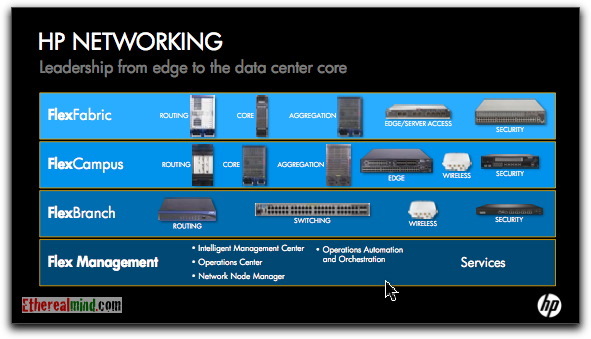 What is it that makes HP Networking products more agile than other products ? For HP, “Open” means published standards. I find it frustrating that HP won’t talk about planned products or futures. It’s impossible to establish a forward-looking strategy based on HP products. On the other hand, when HP ships a product, it’s complete and defined. HP Networking wants you to think that they are growing fast and making inroads into customer. All evidence suggests that there are large deals and good sales volumes. However a twenty times increase in routing might mean that they weren’t selling much in the first place, so I’m going to mark this as “going well” rather than “oooh wheee”. HP continues to impress. 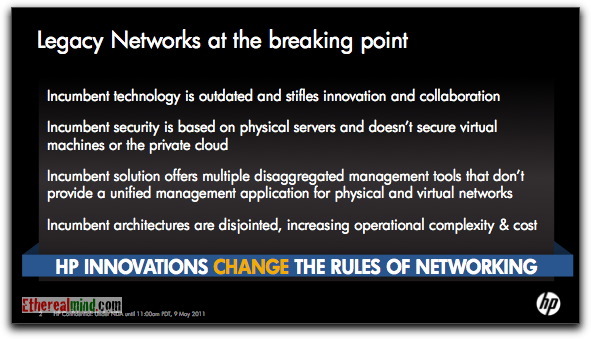 Let me qualify that by saying that the HP Networking story remains patchy. Regardless of the hardware and strategy, the one product absolute standout product from HP Networking is the IMC network management platform. Intelligent Management Center (IMC) V5.0 got another plug, and I’m seeing some real innovation and commitment here. Not only does IMC manage HP Networking gear, but manages other vendors. And, from the demos, goes into a lot of depth – it’s not just reading the SNMPv2 vendor product MIB, it’s able to configure MPLS, VLANs, authentication and much more. I hop that HP Networking continues to invest in IMC, it’s got potential to build enormous customer loyalty. HP Networking have paid for my travel and accommodation for Interop so that I am able to attend the briefing, meet executives and have good quality discussions. I’d like to think that my opinions and views are my own. I am not remunerated in any other way. 100% agree with your comment stating that it’s almost impossible to determine a roadmap based on HP products. We are having this problem right now. I think HP can be as patchy as anyone when it comes to shipping new products. Their server management products, even after years of “development”, still do not address real pain points in day to day operations. HP SIM is a classic example and it’s a product that is a mish-mash of semi-integrated features and capabilities. The current Matrix is equivalent to a Release Candidate (or, not even) and it won’t be until the next version that we’ll see some real cohesion in its orchestration capabilities. HP documentation continues to be absolutely woeful. For the most part I have found it to be badly written, incomplete, not detailed enough, verbose and simply not written to address real world questions. There is a great deal of potential in the next generation of HP infrastructure. But the usability of their software interfaces (whether GUI or CLI) and clarity of documentation must be addressed in order for people to really get excited. HP’s CLI on their data centre products are all very different and often they just don’t provide enough capability. Their c-Class BladeSystems are a classic example. RIBCL in the iLO and OA CLI is very very basic. Their ProCurve switches have a comprehensive help system, but the big fail is that it isn’t contextual. There are many many new technologies and capabilities coming into the data centre. But HP need to fix what they’ve got out there, too. There are SO MANY pain points for enterprise data centres when it comes to HP tech. Much of their management systems just aren’t really enterprise ready. We are an HP shop and I really *really* wish HP would get their act together!